When I picked up the first book in this series, I remember reading it in one day. What was written for my teen became one of my favorite books! After that, with book #2 and now Siren's Song, there has been a battle over who gets to read the newest release in the series. My daughter somehow always wins out. It was no different this time. So, this review is from her perspective because I won't be cracking it open until this weekend. Here's the blurb, and we can chat on the other side! First let's talk about that cover. Honestly, this entire series has contained some of my favorite covers of all time, but this one tops the series. The color and intensity of it...I'd pick the book up even if I hadn't already pre-ordered it! As for the review, I went to my daughter for that:) She has loved every word of this series and snagged the book before I ever had a chance. In speaking with her, she once again fell in love with a setting that is so well written it wraps around your imagination and comes alive right before your very eyes. When she was reading the book, she was IN the book. Nym's journey continued to be an authentic one as she continued to learn not only the depths of her powers, but how to control them. In this book she also worked toward becoming a leader--and this was an aspect of Nym my daughter loved. The secondary characters continue to bring additional life and depth to the pages, and the entire cast is one the reader invests themselves into. While a few parts of the middle were heavier on dialogue than action, this is still a book that glues itself to the reader's hands and infiltrates their hearts. And while this is supposedly the ending to the series, my daughter is putting in a plea for Weber to penn more stories about these wonderful characters. 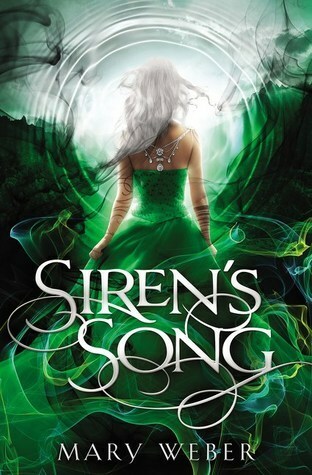 We happily give Siren's Song 5 out of 5 stars and you can purchase it here.